Twigs snapped and leaves crunched as we strode along the dirt track. It had rained the day before and the earthy smell of the damp jungle floor hung in the air. We were visiting Tikal with its roaring Howler Monkeys, buzzing insects and luscious green jungle that hides the magnificent Tikal pyramids. We’d visited the Mayan ruins of Mexico but exploring the Tikal ruins is like an Indiana Jones expedition. And we were excited to see the incredible Tikal Maya ruins. But as I scampered along the jungle path, flickers of apprehension danced through my head. We’d heard so much about the Guatemala ruins of Tikal I was worried they wouldn’t live up to our expectations. But when we rounded a corner and the trees opened up to reveal this. I laughed at my own silliness. Of course, Tikal is amazing! 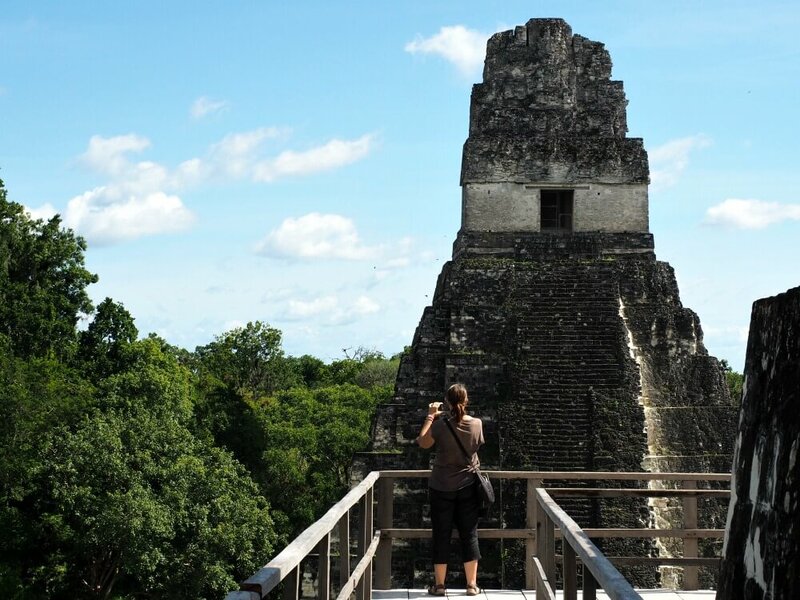 Tikal travel is big business and thousands of people travel from all over the world to see Maya Tikal. 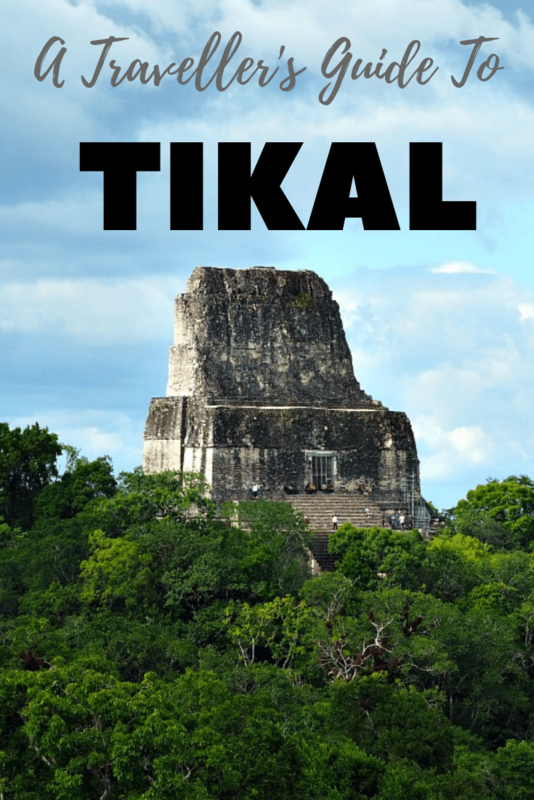 And to help you get the most from your Tikal trip, we’ve created a guide to visiting Tikal. The Mayan city of Tikal was once a powerful empire that was home to around 100,000 people. It gained financial success by making use of its natural resources such as cedarwood, copal, and resin. The Tikal Maya also prospered through the cultivation of maize in cleared rainforest areas and fertile swamps. The ancient city has been partially restored and only fifteen percent of the site has been excavated. It’s now one of the largest archaeological sites of the pre-Colombian Maya civilisation. Visitors can expect to see exquisite temples, palaces, public squares and residential dwellings. 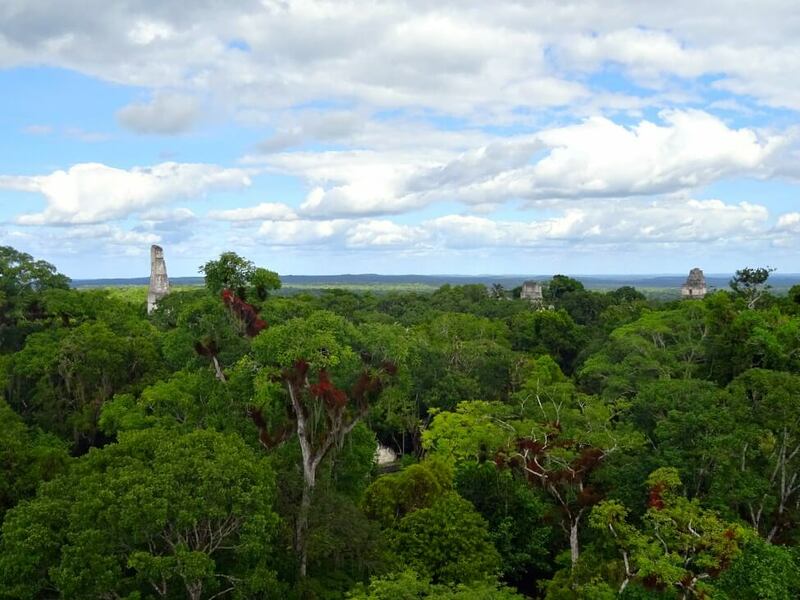 You can’t visit Tikal National Park without knowing a few facts first. So here’s some Tikal information to get you started. Tikal city was named long after its collapse and extinction. The name means “at the watering hole” in the Maya language. The Tikal architecture was built from limestone that was quarried from the local area. For most of its history, Tikal was influenced and controlled by powerful Teotihuacan located in central Mexico. The Tikal Mayan civilization fell into decline around 900 AD. Its demise is thought to be due to drought, but no one really knows. It was never forgotten though and the local people led trips to Tikal in the 1850s. And for the next 100 years, the Tikal archaeological site was visited by explorers and adventurers. Tikal National Park Guatemala was declared a UNESCO World Heritage Site in 1979. The park covers an area of 575 square kilometres and was the first protected area in Guatemala. So where is Tikal located? The ancient Mayan Citadel of Tikal is found in the archaeological region of the Peten Basin in northern Guatemala. Surrounded by rainforest it’s part of the Maya Biosphere Reserve which was created to protect the dense El Peten jungle. Tikal’s location is just two hours away from the Belizean border. 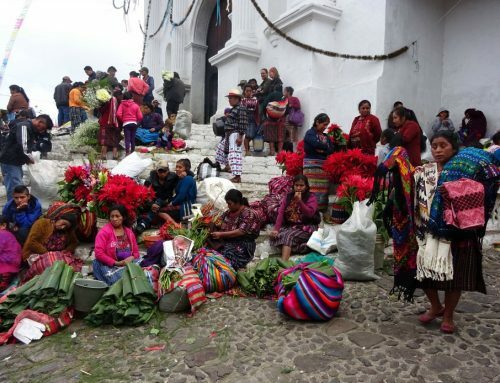 And many visitors to the western part of the country travel to Guatemala on a Belize to Tikal tour. Sixty-five kilometres south of Tikal are the twin towns of Flores and Santa Elena. 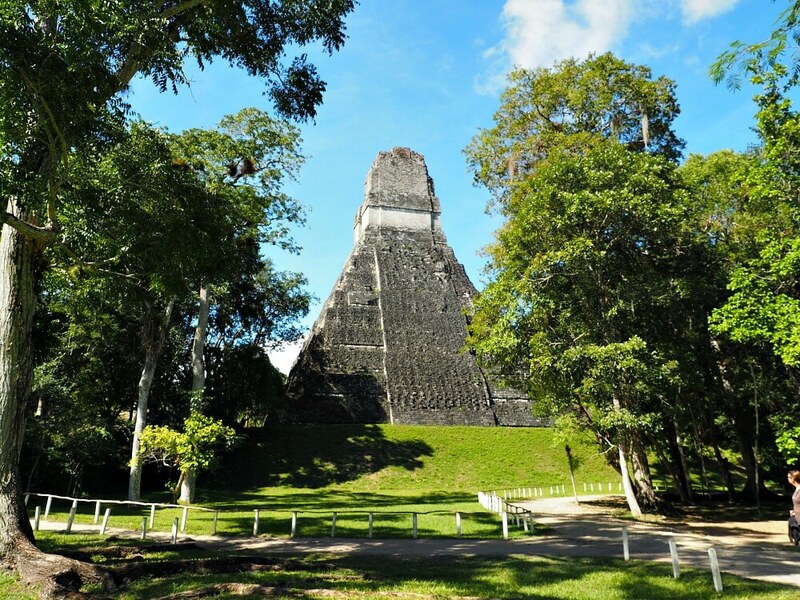 They’re the closest towns to the site and have many popular Tikal hotels for you to choose from. Tikal Entrance Fee: Q150 or about $US 20.00. If you enter the park before 6.00 am for the Tikal sunrise it’s Q250. Tickets purchased after 3.00 pm are valid for the next day. Tickets to Tikal must be purchased from the Banrural Bank of Guatemala. They’re valid for thirty days and activated once you’ve passed the second gate into the park. You can buy the tickets at any branch in Guatemala, but they can only be bought with cash as card facilities aren’t available. There’s also a Banrural Bank at the main entrance to the park where you can buy tickets. However, the second gate near Jungle Lodge does not have a bank. So if you’re staying at the national park you need to buy your ticket before you arrive. As the main entrance is 20 kilometres away and difficult to get to. People travelling to Tikal from Belize can buy tickets at the border from the Banrural Bank near Guatemala immigration. Important: You need an I.D. number such as a passport number to buy your ticket. We weren’t aware of this and arrived at the park without our passports. Freak out! Luckily they accepted Andrew ‘s driver’s license and we were able to buy our tickets. 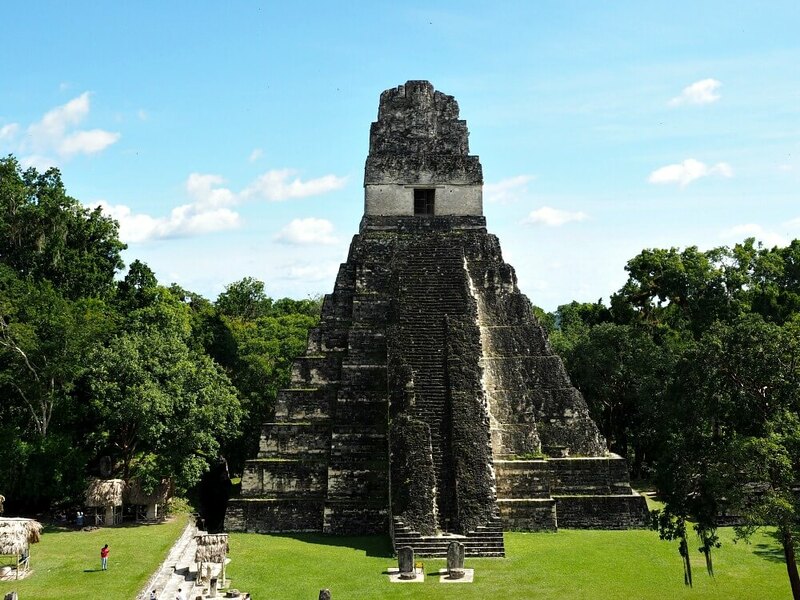 There are Tikal Guatemala tours available from all over Guatemala and Belize. 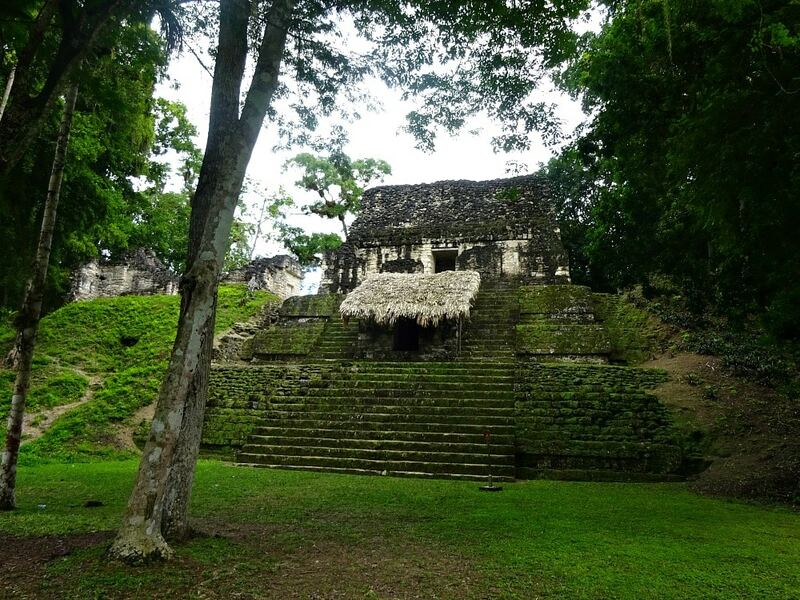 A Tikal tour makes life easy as your transport and accommodation are taken care of. But most people travel from Flores to Tikal. It’s the closest town to the park and tours and transport are simple to arrange. It’s also where the Tikal airport is located. Tikal tours from Flores are popular, and if you opt to do one make sure you research the agency you book with. We’ve heard stories of people being ripped off by dodgy travel agents. Shuttle buses run from Flores to Tikal several times a day and take about an hour and a half to get to the site. The most popular Flores to Tikal shuttle leaves early in the morning. The first bus is at 3.30 am (Uggh!) and arrives in time for sunrise. The second leaves at 4.00 am and gets you there for six o’clock when the gates open. Tikal National Park closes at 5.00 pm and the last bus to Flores leaves at 5.30. You can book an overnight bus to Flores from any travel agent. It’s best to book a first-class bus as second-class buses stop many times along the way. The bus leaves around 10.30 pm and takes nine hours, arriving between five and six o’clock in the morning. If you have limited time and are well rested you can arrange to visit Tikal the same day. 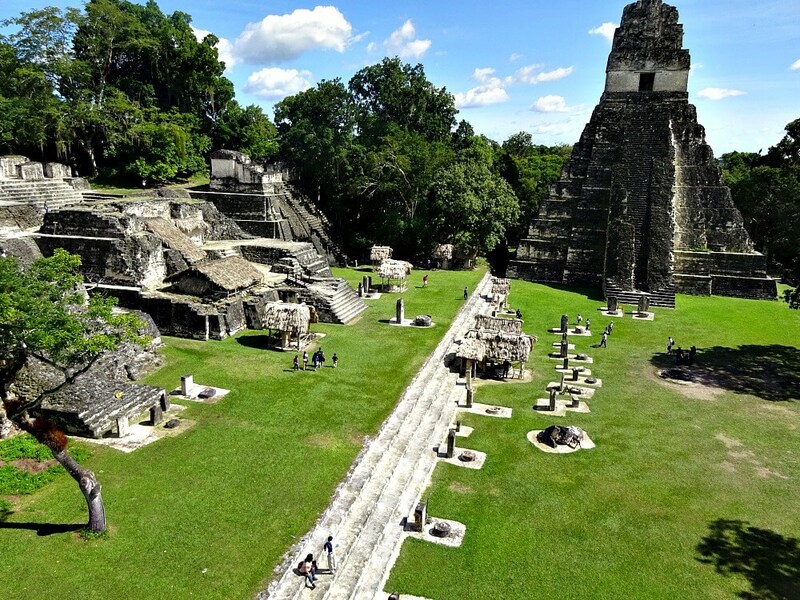 It’s possible to arrange Tikal tours from Guatemala City – costs vary and should include accommodation for at least one night. There are flights from Guatemala City to Tikal (landing in Flores). Book well in advance to get the best deals. There are no direct buses to Tikal from Antigua. So you will need to arrange transport to Guatemala City and catch the overnight bus from there. To make things easier there are Tikal tours from Antigua. 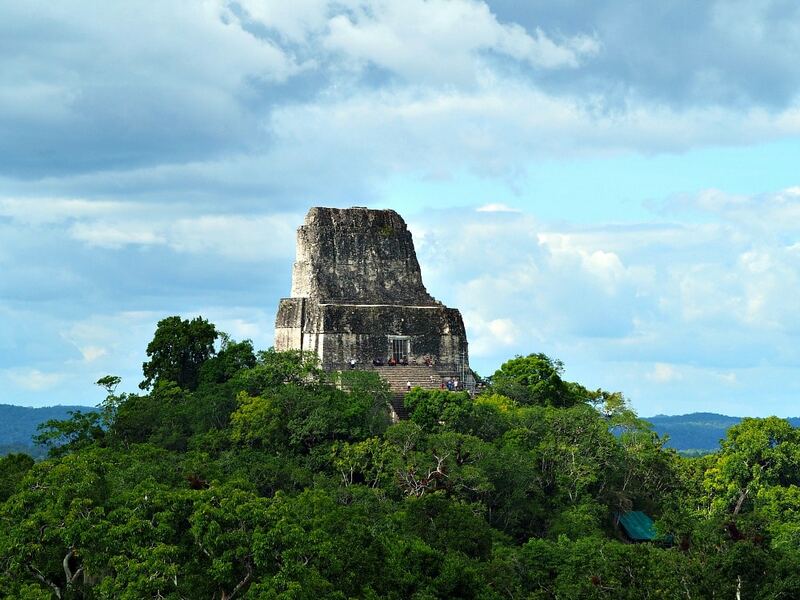 You can visit Tikal as part of an organised tour from San Ignacio in Western Belize. The journey takes about ninety minutes and the border crossing seems to be uneventful. Many tour operators offer transfers to Flores, but it’s possible to do this trip independently. However, as it takes longer, plan to stay overnight so you can get the most out of your Tikal trip. Alternatively, head to Flores and go from there. 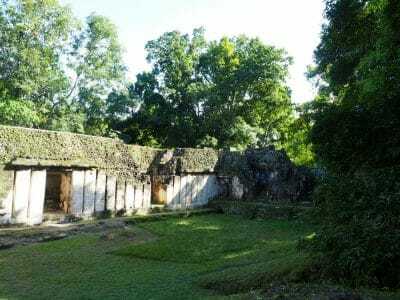 The cheapest and safest option to get to Tikal from Belize City is to catch a shuttle bus. It takes five hours so it’s not possible to do as a day trip. And you might want to book some overnight accommodation beforehand. Tropic Air flies from Belize City to Tikal Airport in Flores once a day. The flight leaves around 4.30 pm and takes about one hour. The return flight is at eight o’clock in the morning. You can check flight costs here. Note: Many buses say they are taking you to Flores Tikal (the words seem to be interchangeable), but actually stop in Santa Elena. From there you will have to take a tuk-tuk or taxi. This should only cost a couple of dollars but only quetzals are accepted. If you arrive from Belize you will need to buy local currency at the border. The two main options for accommodation in Tikal are to stay in the national park or the backpacker town of Flores. Both options offer different experiences and have their advantages and disadvantages. And it really depends on your personal preference and plans for Tikal as to which is best for you. 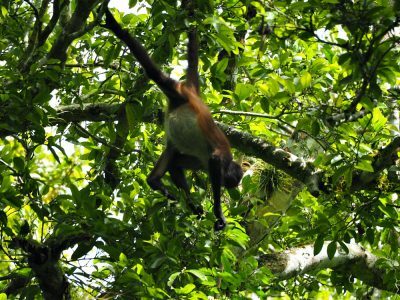 A night in the national park will give you a wonderful jungle experience. 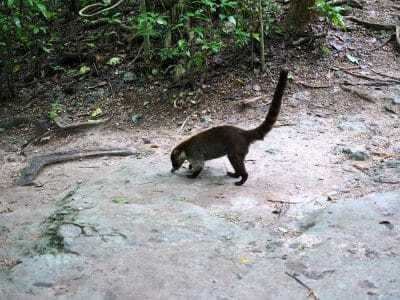 And you’ll most likely see an abundance of Tikal wildlife. It’s perfect if you’re planning a sunrise tour, as you’re right there at the park. The downside is that you’ll be fully dependent on the hotel’s services. The food at the restaurants can be bland and expensive and you may be stuck there without any transport. You’ll need to bring plenty of cash as there aren’t any ATMs. This is the cheapest option in the archaeological site and is located at the park’s second gate. The rooms are basic with comfortable beds, a safe environment, and ceiling fans. There is no air conditioning and the rooms have shared facilities. Sometimes called Tikal lodge, it’s more like a Tikal hostel than a Tikal hotel. It does have a pool however, which is great for relaxing after a hot day of sightseeing. For more information and the latest prices for the Hotel Jungle Lodge click here. This resort sits on the edge of the jungle and is only a ten-minute walk to the ruins. It offers rooms, suites, and villas at various prices and you can choose from either pool or jungle views. For true nature lovers, there’s a satellite building snuggled in the jungle where you can lap up all the wildlife you want. For more information and the latest prices for Tikal Inn click here. Jaguar Inn offers two different types of accommodation for you to choose from. It has thirteen bungalows equipped with ceiling fans, hot water, and private ensuite bathrooms. And for the more adventurous there is budget friendly tent lodging. The resort also offers twilight or full moon tours where you can star gaze surrounded by jungle and the ancient Mayan ruins. For more information and the latest prices for Jaguar Inn click here. 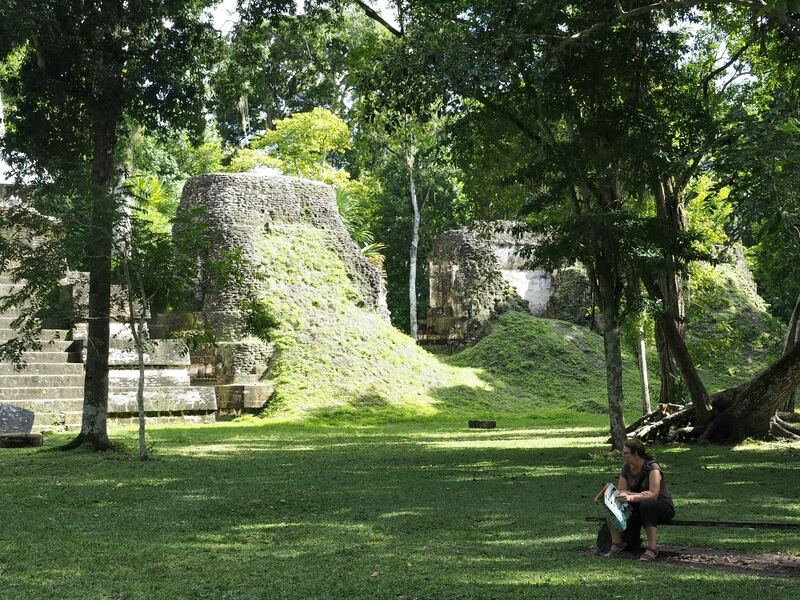 The easiest access point to the archaeological site of Tikal is the laid-back town of Flores. Located on a gorgeous island in Lago de Peten it’s connected to its sister city Santa Elena by a 500-metre causeway. The town is quite delightful with colourful red-roofed buildings and cobbled streets. And with its abundance of accommodation options, restaurants, cafes and tourist services. It’s the perfect place to base yourself for your Tikal excursions. The only downside is its distance from the site (about 65 km), which can make it hard if you want to do a sunrise tour. With its great location right on the lake shore, sunset views from the bar and excellent pool, you can’t go wrong. For more information and the latest prices for Hotel Casona de La Isla click here. The Green Monkey is a popular backpacker choice with dorm beds and private rooms. Located on the edge of Lake Peten this hostel has stunning lake views, two terraces, and everything else you need for a comfortable stay. For more information and the latest prices for the Green Monkey Hostel click here. Do yourself a favour and buy yourself a map. Tikal is huge and without a map, you’re unlikely to see all the temples without getting lost. The signs around the park are confusing and the arrows seem to point to nowhere land. Or else they’re lying around on the ground of no use to anyone. Even with a map, we found ourselves backtracking more than once. I know getting lost can be fun. We even advocate for it sometimes! But you don’t want to waste time when you’re visiting Tikal. Maps are available outside the visitors’ centre for Q20. Alternatively, there’s a sign with a map you can take a photo of after you pass the ticket counter. The Great Plaza was the heart of Tikal and the main focus of sociopolitical life. It sits at the centre of the site and is bordered by Temple I and II, and the North and Central Acropolis. Temple I or the Temple Of The Great Jaguar has a carved lintel of a king sitting on a jaguar throne. It’s dedicated to Jasaw Chan K’awil (Ah Cacao) who was entombed there in 734 AD. Temple II is also known as the Temple of the Masks due to a couple of funky looking masks that flank the stairway. Thought to be a monument to Jasaw Chan K’awil’s wife the pyramid faces the rising sun. 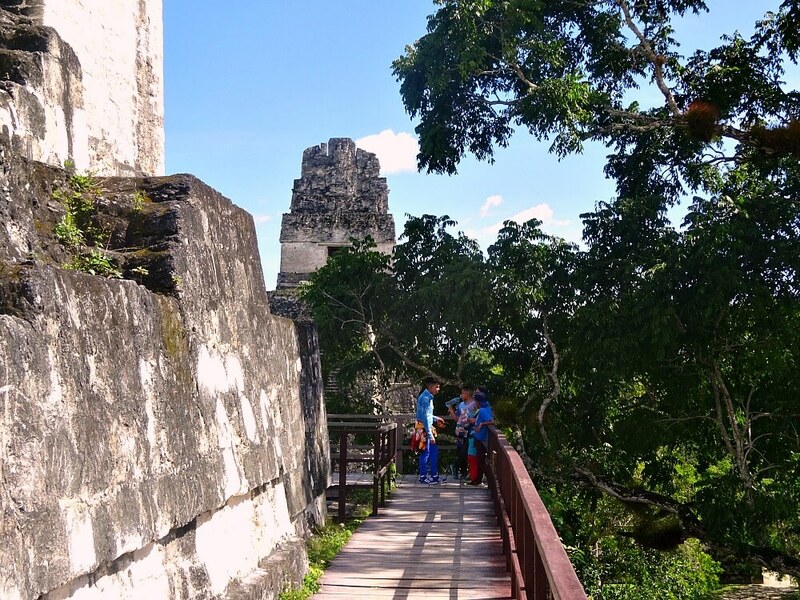 It’s possible to climb the temple for fabulous views of the surrounding ruins and Tikal jungle. Temple III, or the Temple of the Jaguar Priest, is thought to be the resting place of King Dard Sun. At 55 metres high it soars above the jungle canopy and is a gasp-inducing sight. It was the last of the Tikal pyramids to be built before the demise of the Mayan city. Temple IV is also known as the Temple of the Double-Headed Serpent. Don’t you just love these temple names? 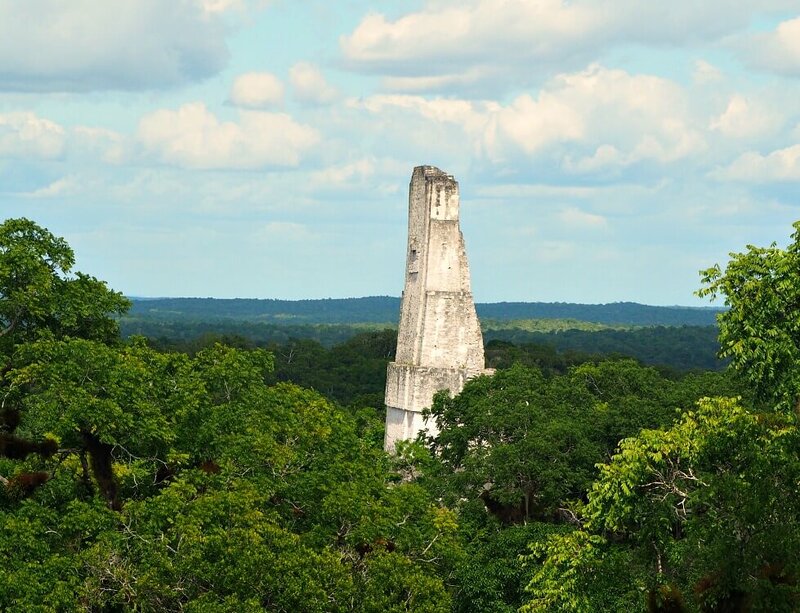 It stands at an awe-inspiring 65 metres high and is thought to be the tallest structure built by the ancient Maya. And no trip to Tikal is complete without huffing and puffing your way to the top. The views are spectacular with Temples I, II and II rising above the Guatemalan jungle. The view of the temples of Tikal soaring out of the Guatemalan jungle was used in Star Wars Episode IV: A New Hope. The views from Temple IV are a must see. Temple V stands at 57 metres high and is the second tallest structure in Tikal and pre-colonial America. It’s the funerary pyramid of an unknown ruler. Temple VI was discovered as recently as 1951 and is known as the Temple of Inscriptions. Hieroglyphs adorn its roof-comb and tell the story of the city’s dynastic history. Guides and tour groups tend to limit their focus to the temples near the main plaza. Which is a shame as they’re missing out on the magical Lost World. Its unique architecture shows another side to Mayan culture that was dedicated to astronomy. Data collected from their observations were used to calculate the complex Mayan calendar. 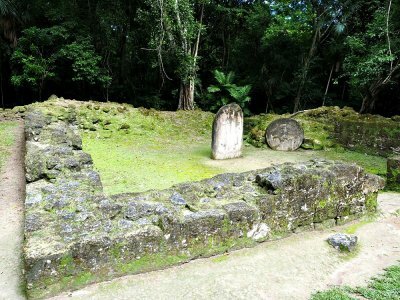 The two important pyramids in Mundo Perdido are The Grand Pyramid and the Temple of the Three Rooms. The Grand Pyramid stands at 32 metres high and has a staircase on each side that reaches the top. Its summit never had a temple and was used as an astronomical observation point. As its name suggests the Temple of the Three Rooms had three rooms built on its peak. The pyramid has its own unique style not found elsewhere in the complex and is thought to have been built by the people of Teotihuacan. Another interesting feature of Mundo Perdido is the Temple of the Skulls. The third highest pyramid in the Lost World complex, it’s adorned with sculpted skulls. One faces forward and there are two others in profile. Acanaladuras Palace or Palace of Vertical Columns derives its name from the column-like structures it features. Its also known as Group G and is one of the largest groups to be uncovered. There are vaulted chambers and ceilings and the remains of a second story. For some added curiosity, archaeologists also found a stucco mask featuring a character called the Witz Monster. There were heaps of butterflies here when we visited. And we spent ages trying to photograph them. They never keep still! The Bat Palace has tiny bats hanging from the ceiling that occasionally fly around. The building’s many west-facing windows have earned it the nickname the Palace of Windows. Built on a hill it was originally two stories high but the top story has crumbled. The palace was home to many Tikal rulers. 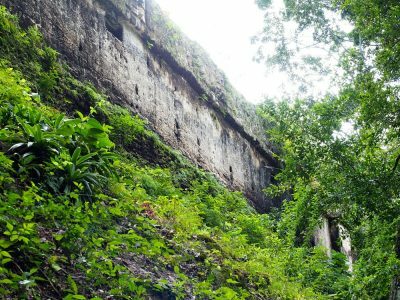 Although the ruins themselves are incredible, the natural wonders of the El Peten jungle are an integral part of the Tikal experience. The ancient jungle that surrounds the park provides habitat for a wide range of animals. We spotted, spider monkeys, coatimundis, agoutis, dainty butterflies and our first toucan! There is much more wildlife than we managed to spot though. Even jaguars. Your best chance to see them is at dusk. Natures soundtrack with its screeching parrots and buzzing insects is a constant reminder that you’re in the jungle. 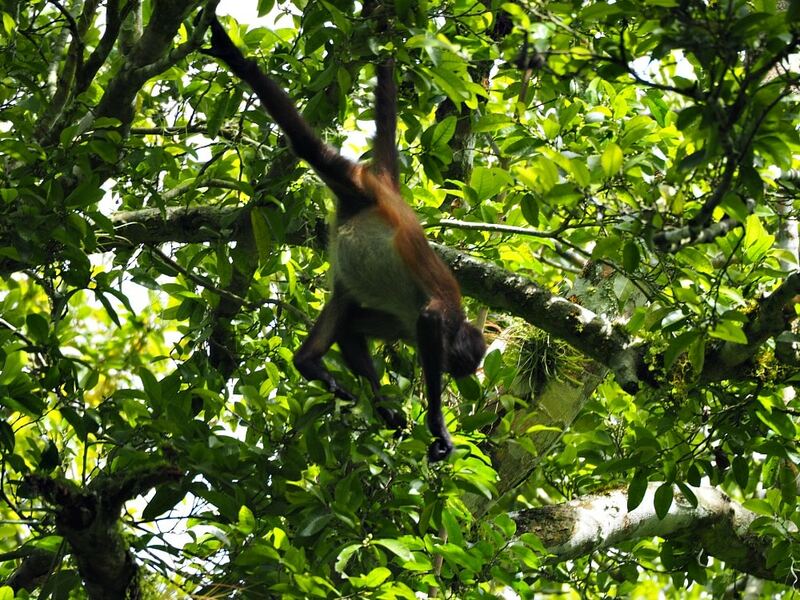 But, my biggest thrill was hearing the howler monkeys roar. Fun Fact: It’s said the howler monkey roar was used by Steven Speilberg to create the sound of velociraptors in Jurassic Park. I don’t know if this is true but gosh they sound like them! There are two small museums near the entrance to the park, the Museo Litico and Museo Sylvanos G Morley. They are tiny but worth a visit to gain some understanding of Mayan history. The Museo Litigo is the largest of the two and houses carved stelae taken from the ruins. There are also interesting photographs of the jungle-covered temples that were snapped during excavations. Museo Sylvanos G Morley displays ceramic pieces discovered within the park. There are descriptions for each of the displays in Spanish. Your Tikal admission fee doesn’t cover the cost of the museums, but thirty quetzals gets you into both. Photographs are not allowed inside. The sun can be relentless so bring plenty of water and money to buy more. Allow more time than you think. The distances between temples are long and Tikal is huge! Have a picnic under the trees while gazing at the ancient ruins. The food at the onsite restaurants is bland and overpriced. Be careful when climbing the pyramids and if you feel at all unwell, take a break. Wear comfortable sturdy shoes and watch out for slippery wet stones, roots, and logs. You’ll need a torch if you sign up for a Tikal sunrise tour. It’s hard to see the path in the thick jungle without the sun in the sky. Same goes for a Tikal sunset tour. Please take your rubbish with you out of the park. Don’t feed the Tikal wildlife as it creates a dependency on humans for survival. But the best tip of all is to have a wonderful time! The Tikal archaeological site is just spectacular. I really can’t rave enough about it. 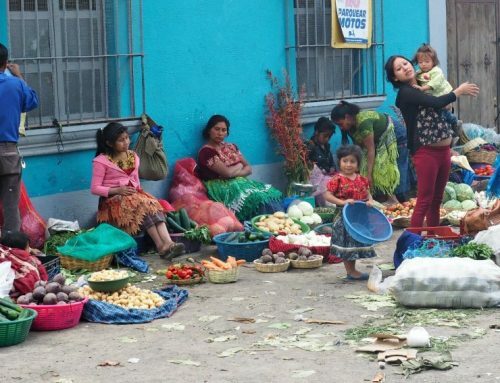 And it’s sure to be a highlight for anyone that visits Guatemala. 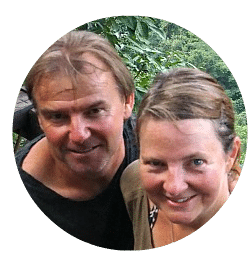 If you are planning a trip to Central America you can learn more about our time in the region by clicking here. Have you been to Tikal? Or perhaps you have some questions. Let us know in the comments below.